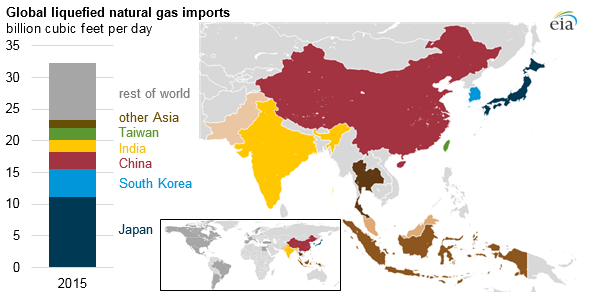 Asia is the world’s largest consumer of liquefied natural gas (LNG), accounting for three-quarters of global LNG trade and one-third of total global natural gas trade. However, the region lacks a pricing benchmark that can reliably reflect supply and demand changes in Asia’s natural gas markets. Natural gas market hubs, such as Louisiana’s Henry Hub or the United Kingdom’s National Balancing Point (NBP), have been a key feature of competitive gas markets in the United States and Europe. These hubs provide locations—either physical, in the case of Henry Hub, or virtual, in the case of NBP—for trading natural gas and ultimately for determining price. The most important hubs have publicly reported price indexes that are benchmarks for the value of natural gas in the larger regional market. Currently, no location in Asia has sufficiently developed physical infrastructure or regulatory frameworks to accommodate the creation of a natural gas trading hub, but the governments of Japan, China, and Singapore are each exploring the possibility of establishing an LNG market hub. Given the emergence of the United States as a major LNG supplier and the potential impact on the structure of future LNG trade in Asia, EIA commissioned a contractor study that examines efforts to establish regional LNG trading hubs and price benchmarks in Asia and some of the inherent challenges they face. Fully established natural gas market hubs, such as the United States’ Henry Hub, have high liquidity, with a high volume of trades; open access to transport facilities; and transparent price and volume reporting, index pricing, and futures contracting. In comparison, hubs such as those in France and Italy have lower trading volumes and less liquidity in forward pricing. While natural gas hubs in North America and Europe are pipeline-based (for example, Henry Hub is located in Louisiana, close to natural gas infrastructure on the U.S. Gulf Coast), major countries in Asia rely on LNG as the primary source of natural gas. LNG-based hubs present a number of challenges compared to pipeline-based hubs. Pipeline hubs rely on continuous flows of natural gas, daily scheduling of receipts and deliveries, standardized natural gas specifications, uniform transportation and contracting rules, and diligent regulatory oversight. In contrast, LNG shipments can be large and difficult to store, there can be significant time between contracting and delivery, and cargoes can differ in LNG specifications. Asian LNG import terminals have limited pipeline interconnectivity and operate primarily under long-term bilateral contracts between multiple suppliers and buyers, which limits transparency, third-party access, and publically available price benchmarks. More information on the development of LNG market hubs in Asia can be found in the full report.